I love to recycle and re-purpose – if I can figure out a way to make something that would normally be trashed into something useful or beautiful – or both – I’m up for the challenge. I’ve been thinking about this project for a while now and finally committed myself to actually having a go. 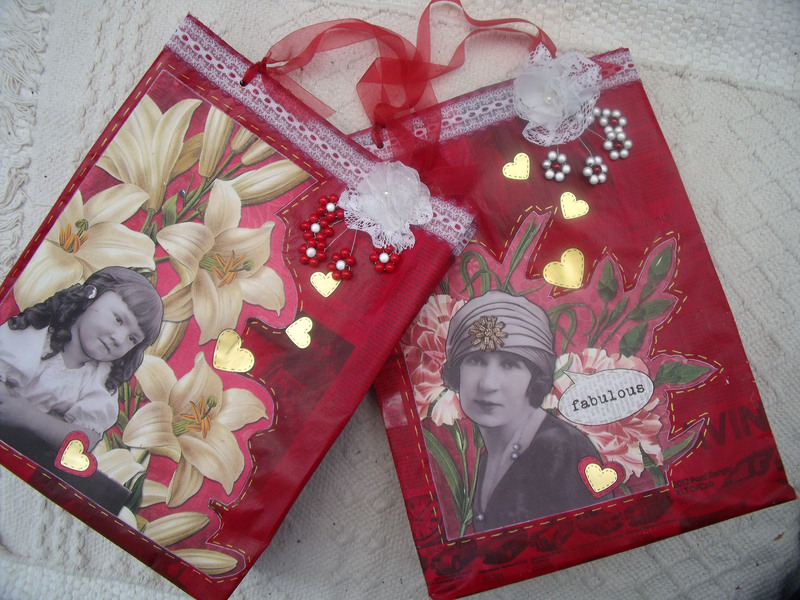 It came about this way…..
Do you remember I made a bunch of small gift bags a while back. I wanted to make some really big ones, you know, the size of a good shopping bag and I had figured I would need six 12 x 12 sheets per bag. Using quality specialist paper would have made the cost prohibitive – I mean $24 just for the paper and I haven’t even put the time in yet …. 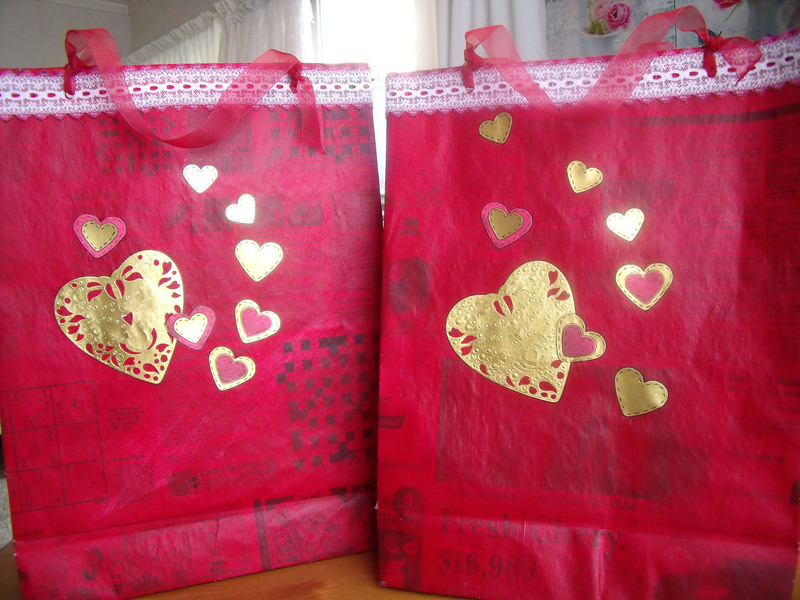 you can buy big gift bags at the moment for $2.50…..
With my creative mojo firing on all cylinders I had the genius idea I could make them from newspaper – the big giant ones. An open double page measures 80 x 57 cm – I’m sorry I can’t convert that off the top of my head for you non-metric folk…… perhaps someone else might in the comments 🙂 Anyhow, it’s big! I painted two double page spreads with a thick layer of paint and left them to dry overnight. The next day I turned the paper over and ran wrestled a length of contact paper over the page. 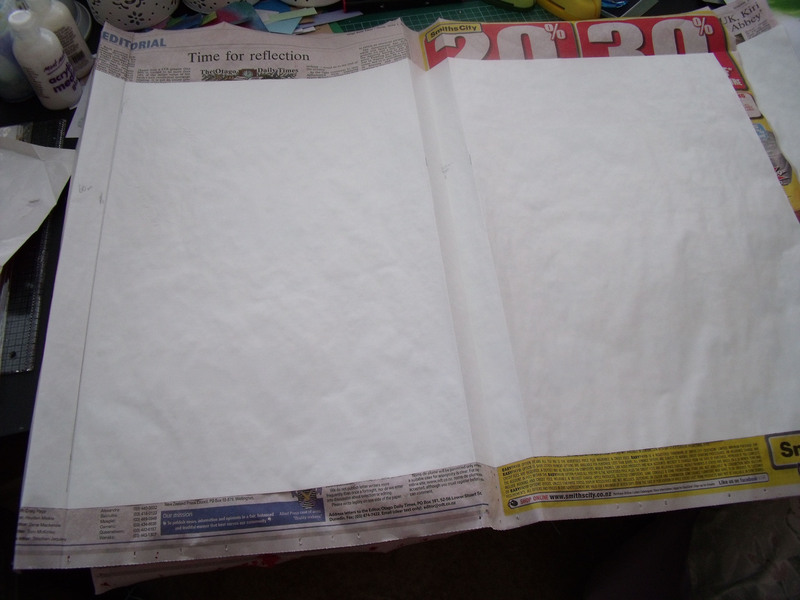 [Contact paper is used to cover books and shelves – sticky on one side and a plasticky / wipeable finish on the other.] I used this to give the newspaper some strength and durability. I worked out my score lines for width and depth and top and bottom ……. ooooh headaches!! I like that you can still see the newsprint showing through – but the photo is not true to the red I used – think blood red and you’ll be closer to the truth of it. 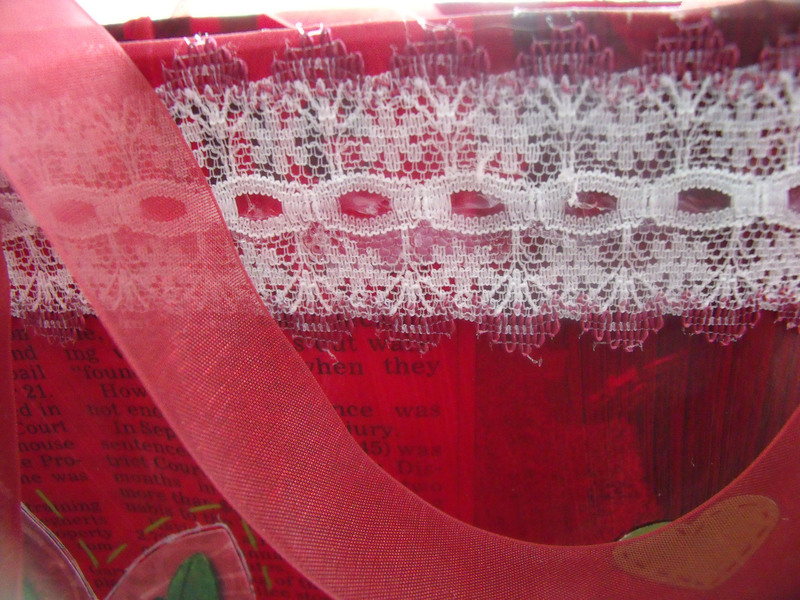 With the basic bag hanging together quite well it is embellishment time – Hurrah!! 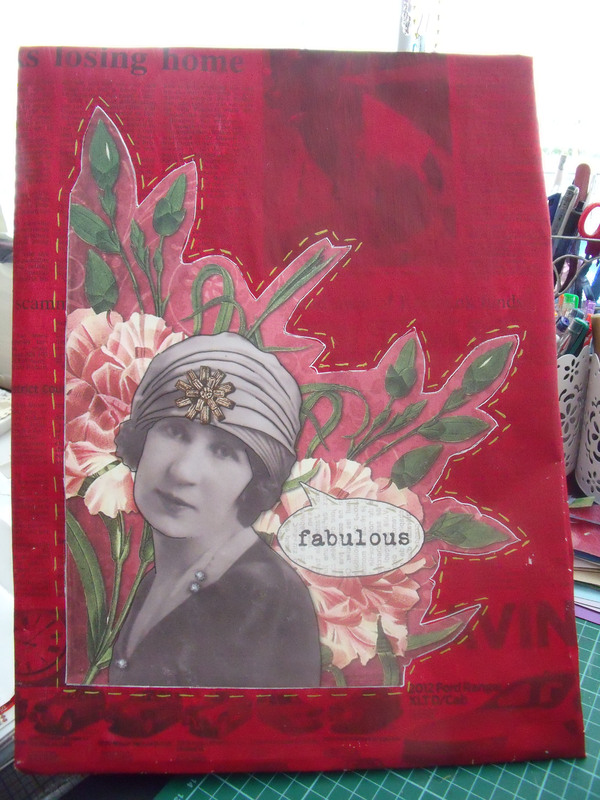 I rummaged through my paper stash and found a 12 x 12 vintage collection that I purchased in a sale a year or two back and have never known what to do with – I chose two different pictures and roughly cut out around the images and stuck one on each bag. Using white, black and gold pens I highlighted the edges of the cut outs, faux stitched outside the edges and outlined different aspects of the woman. 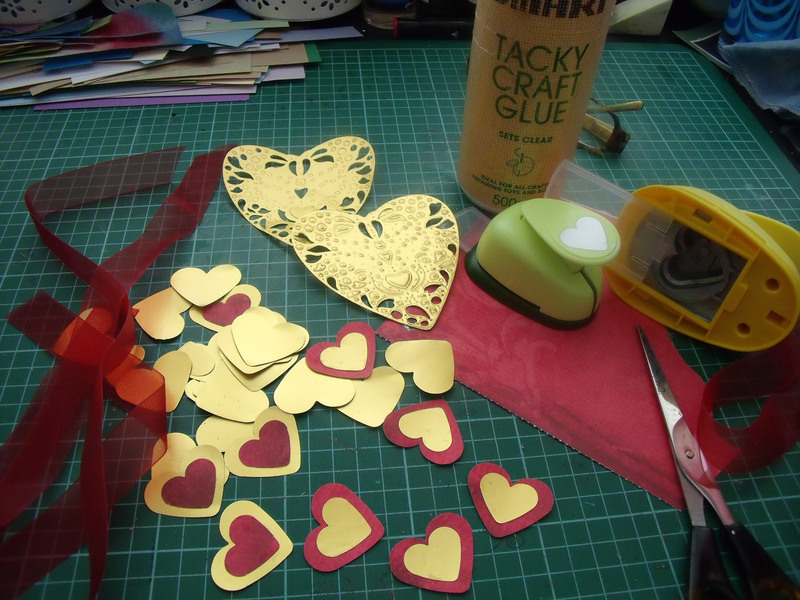 The hearts were given faux stitching in black pen. So, looking good you say – finished? The beaded flowers I learnt to make from someone on the internet two or three years ago and I’ve completely forgotten who it was – but they too are fun to make. It’s just beads and twisted wire and they hang freely and move about which adds another layer to the whole thing. I think they are finished – but there is still three weeks til Christmas, you never know what might happen to them between now and then….. I think they came out quite well for a first try – I learned lots and know how to do it now…. 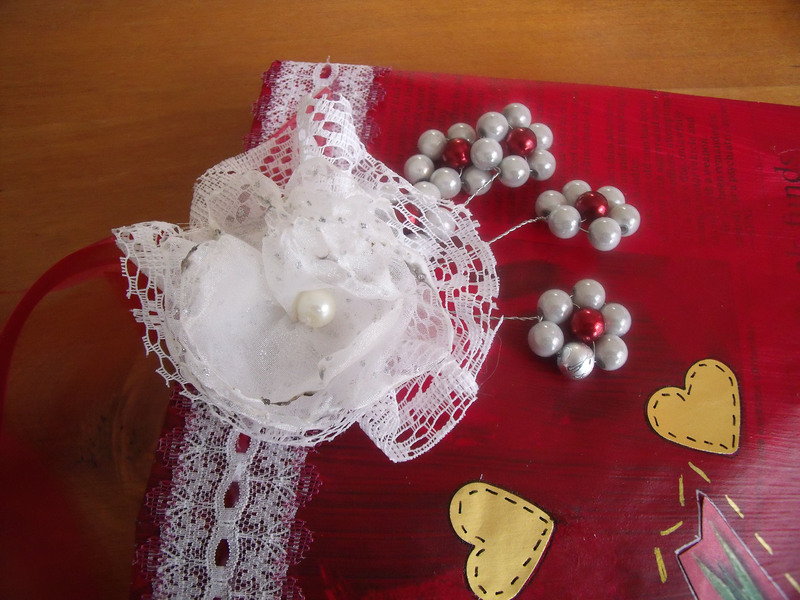 This entry was posted in Creations From My Craft Room, Creativity, Hand Made Flowers, Paper Crafting, Recycling and tagged Christmas, Contact paper, Crafts, Do it yourself, giant gift bags, Otago Daily Times, paper, re-purposing, recycling by thecontentedcrafter. Bookmark the permalink. Thank you for visiting my blog Sartenada, I am happy to meet you! I like your ‘coffee bags bag’ very much and the instructions are excellent! I shall have to save my coffee bags from now on – I have always felt there must be a good use for them 🙂 Have a great weekend! Hi Pauline! I love this project and your bags turned out beautifully! Especially your theory on if a lot is good then more is better–I agree! I love it Pauline! I posted a week ago or so after a long absence. I’m so happy to be checking out your projects! Squeal! These are terrific. We sure are on the same wave length. I’m sorry I saw this *after* my reuse/repurpose post as it would have been perfect to include it. As always, I love the way you ‘layer up’ improving and finessing as you go. These are a lovely color and a clever design. It also looks like lots of fun, and although it sounds like you encountered some frustrating moments, overall, it looks like you had a good time. Sorry about the return of cold weather. Hopefully the sun will be out again soon. The frustrations were relatively minor, I always have something I have to work through – a bit like life really 🙂 I think that’s part of the not giving up at the ugly stage scenario don’t you think? The sun has been and gone again and now we are having quite strong winds – which is unusual for this area. It’s all change! Thank you, Pauline. There is so much out there to explore. I had the same problem at the library or bookstore. How could I ever get to all the good stuff. I suppose if it was all easy and without challenge, we wouldn’t feel the growth or accomplishment. As you say…a bit like life! I also follow a gardening post in NZ. She posted that the wind snapped all the posts supporting her beans and that the winds were so heavy there wasn’t nothing to be done but wait it out. Crazy. 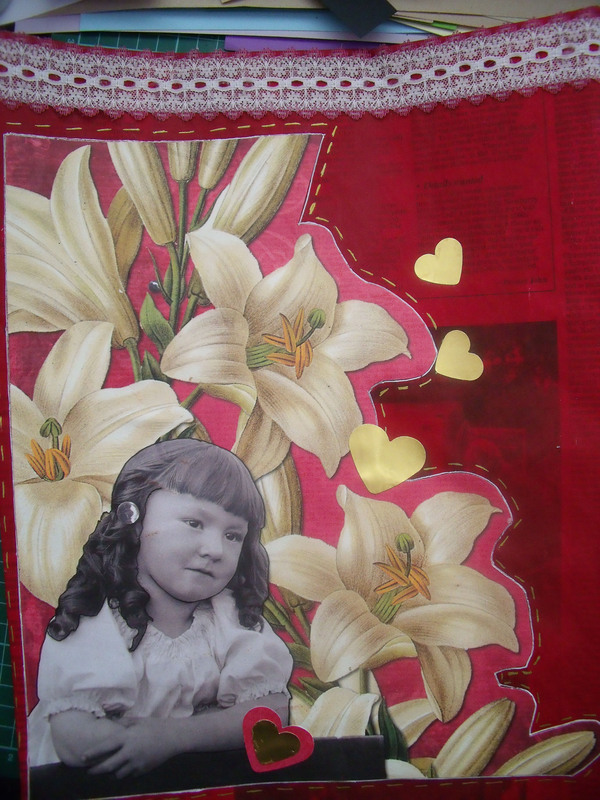 What an absolutely gorgeous project, Pauline! I liked the intrigue this post created – my thoughts as I read – “large newspaper gift bags – no – newspaper? – no – oh! I see – painted – but don’t you need another coat? – gosh, contact – haven’t seen that since mum made me sit down and cover my year seven text books in it – oh! gorgeous vintage pics – beautiful embellishments and additions – oh! so glad no second coat of paint – newsprint looks great showing through – what an incredibly amazing and unique result. What talent.” Reusing, repurposing and recycling never looked so good! Oh, I loved reading your thought process as you went through – that is such good feedback! I always try to show the ‘providence’ of things I alter and change up – kind of like leaving the original wallpaper inside the wardrobe as proof of what once was – hence the one coat of paint and the newsprint showing through …….. it’s fun to go back and try to decipher what you can see. Thanks Annie – isn’t it great to think you can do stuff with old newspapers!! 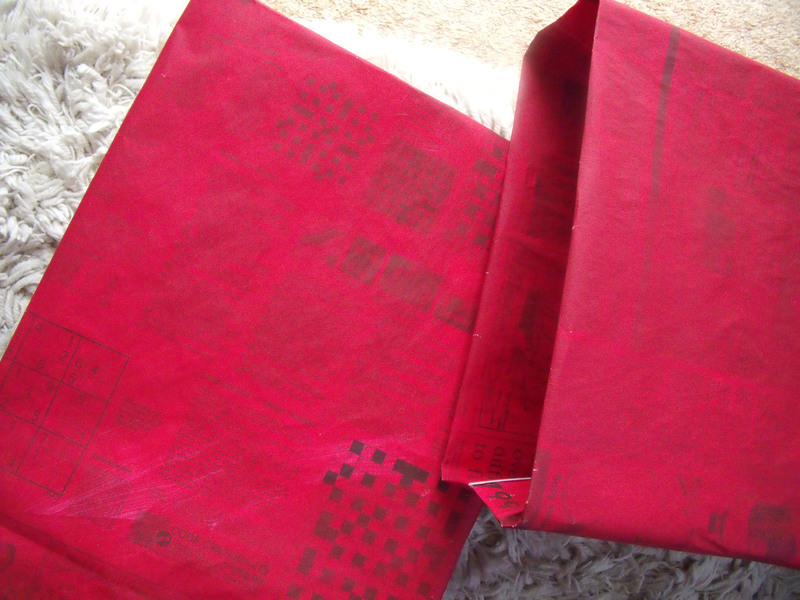 I’m pleased you all know what contact paper is – I’m still trying to find out what ‘deli paper’ is and what we might know it by here……… sometimes items are internationally recognisable, sometimes they aren’t. When I see newspaper I see bird cage liner (unless it has one of my columns in it). I admire your vision! Chuckle! I wish that was true – I just have really random ‘good ideas’ and then sweat for hours trying to make them a reality 🙂 Many don’t make it ….. Thanks Hon 🙂 If it’s raining i guess that will keep the fires away – so that’s good! We had warm sunshine again today – but the previous three days were a return to winter…. brrr not nice! How clever to use the newspaper. 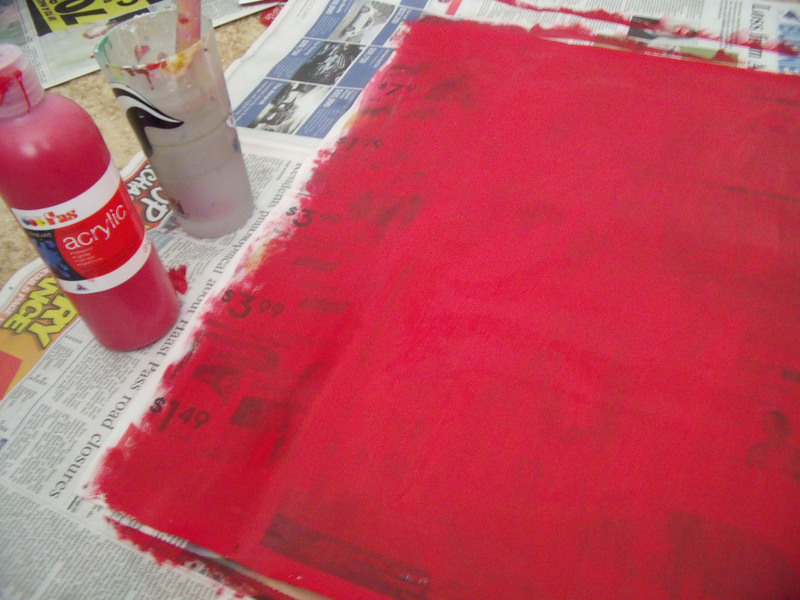 It dried a lot flatter than you’d expect when putting wet paint onto thin paper. How ever did you come up with contact paper? Very clever. I haven’t seen that around in years here. They must have it somewheres, maybe I’ve just never looked for it. Of course I’m a pushover for everything vintage and really fancy the black and white photo’s you made use of. What did you use to stick them on? Just white glue? Now you’ll have to find a very extravagant give since the bags are so special. Re: easy approximate conversion from cm to inches is # of cm divided by 2.5 (80 / 2.5 = 32) So it works out very close. You are nothing short of a genius! My brain doesn’t seem to be able to do math any more – do you think it’s an age thing? Poster paint is quite good for things like this – its pretty gluggy and I didn’t use a lot of water, just enough to move it round and to the edges. The vintage prints are on really strong card – probably 180 gsm so I used a liberal coating of tacky glue to ensure good stickability. I also forgot to mention that after everything was stuck down, but before I added the final touch of bling, I gave the entire exterior a double or treble coat of matte spray varnish which will also help ensure stickability and durability. I think there is a lot more we can do with a newspaper – it has to be good for something right? LOL, “till the end of the world”…good to know..you kill me. I’m afraid newspapers will be gone like the dinosaurs soon. I just watched a segment all about ‘Bitcoin’. Currently legal tender on many websites and Germany. No bank, no svc charge and currently no tax…things are changing pretty fast. Ah, Boomdee the Reb – there’s a bitstrip!! They are changing! Not always for the worst either ….. I like the sound of that ‘Bitcoin’ thing, must check it out.